As the title says we are moored near Watford, as in the the village of Watford, and not the sprawling mass just north of London. Anyway, it has been a while since the last post so a bit of a catch up is required. As planned we left Napton on a return journey for Yelvertoft, stopping briefly in a number of previously visited locations. 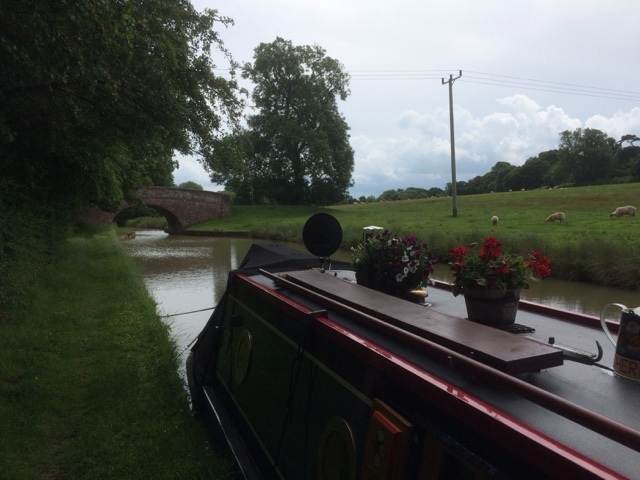 We did however break the journey from bridge 100 on the Oxford Canal to Norton Junction, by stopping for a night halfway up the Braunston flight in the Admiral Nelson P.H. pound. Of course being so close a visit had to be made. 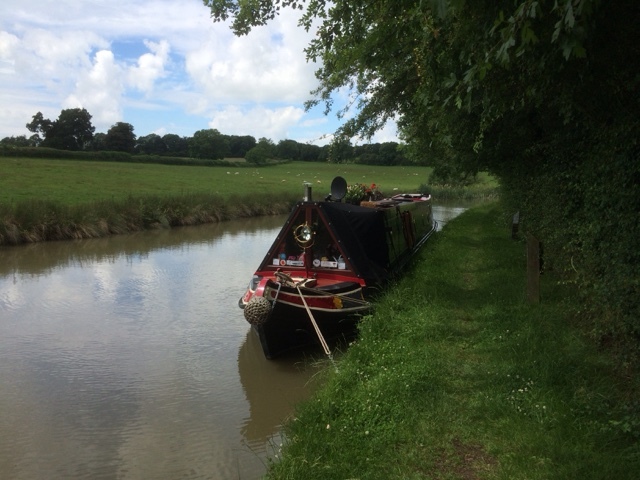 Sunday lunch on Fathers Day was enjoyed at the New Inn, Long Buckby, before heading off up Watford Locks and transiting Crick tunnel the following day. We stopped just beyond bridge 20 on the Leicester Line G.U. a usual spot for us, close to Yelvertoft Marina. 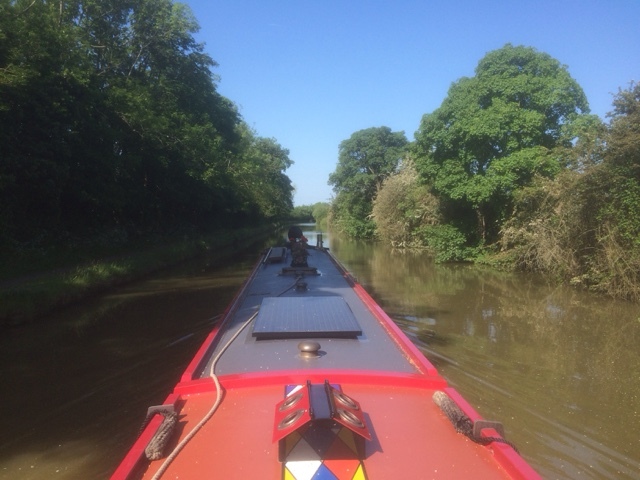 On Thursday 23/6 we headed off towards the unofficial winding hole a mile ahead by bridge 24. It is very much silted up now and we only just made the turn. Had we been unsuccessful the next winding hole would have added three hours to our journey. 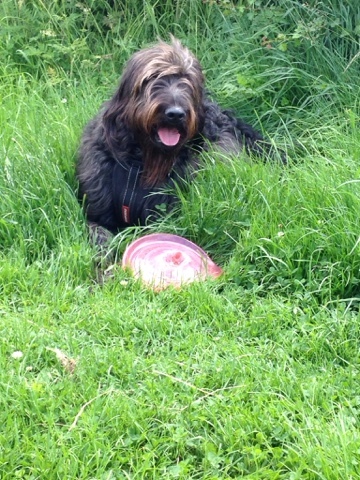 Oscar sunning himself on the grassy towpath. Once in the marina we had a few boat type chores to do over the next couple of days, before heading off for the weekend to visit family. Now for the best bit. On Tuesday 28/6 it was our Pearl Wedding Anniversary. 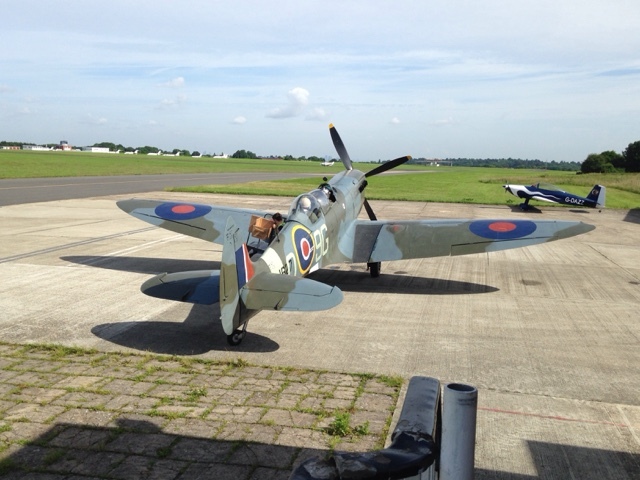 We set off from our hotel close to Brands Hatch heading for Biggin Hill airfield. The former RAF station was one of the main airfields defending London during the war and is now privately operated. We travelled the perimeter road to a hanger at the far end of the airfield which is filled with a selection of aircraft from both the RAF and Luftwaffe. After checking in we attended a safety briefing, which basically amounted to, these are the risks, as if they were going to stop me, then it was off to be kitted out with flight suit and gloves. The next thirty minutes words can't really describe so I will let the photos do it. 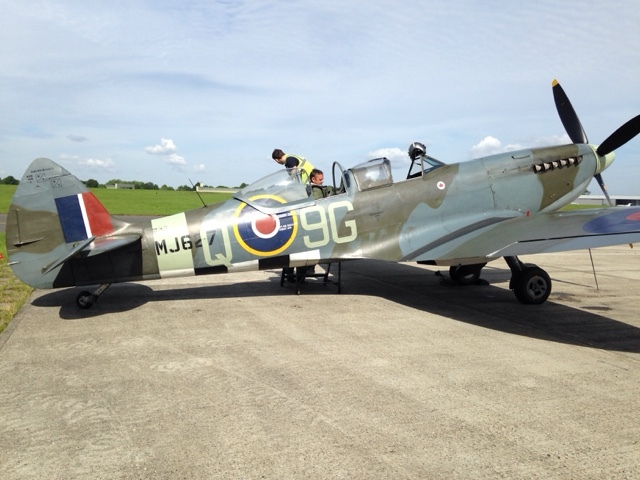 The Spitfire in question is MJ627. Built at Castle Bromwich in 1943, she entered service with the Royal Canadian Air Force. MJ627s first operational sortie was from an advanced landing ground in Belgium. After only two days of service MJ627 destroyed a Messerschmitt Me 109 over Arnhem being flown by Pilot Officer Sidney Bregman. The aircraft commander for my flight was Don Sigournay, a former Royal Navy pilot who flew Sea Harriers. Being the first flight of the day, on start up the engine stalled, belching smoke from its twelve exhaust ports. Second time round, no such problem. 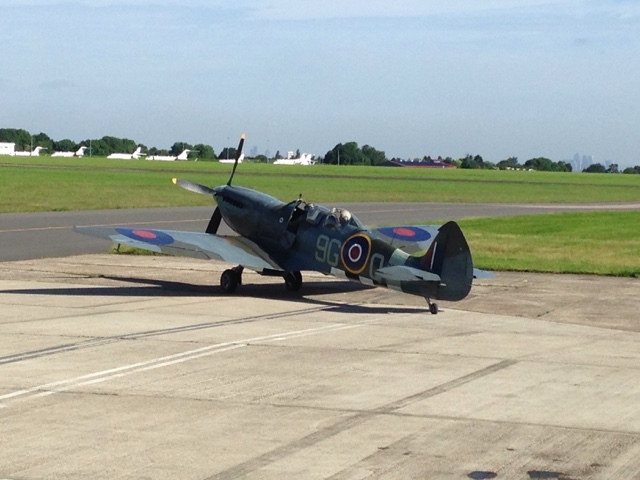 We taxied towards the runway and then waited whilst the Rolls Royce Merlin engine warmed to operating temperature. As we moved onto the runway final readings of the gauges were made before the throttle was opened and in no time at all we were airborne. 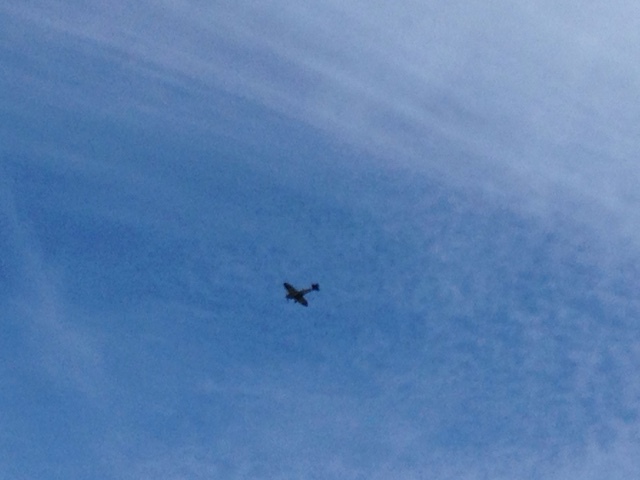 The Spitfire begins to fly at about 85 knots. Climbing away from Biggin Hill we made a quick turn left, taking us away from the controlled airspace of Gatwick airport. On reaching our cruising altitude the engine was throttled back, and wings levelled as we flew south east over the Kent countryside. What occurred next I had not been expecting. I had thought I was going to be simply a passenger, up there for a ride. Now I was being offered the controls. 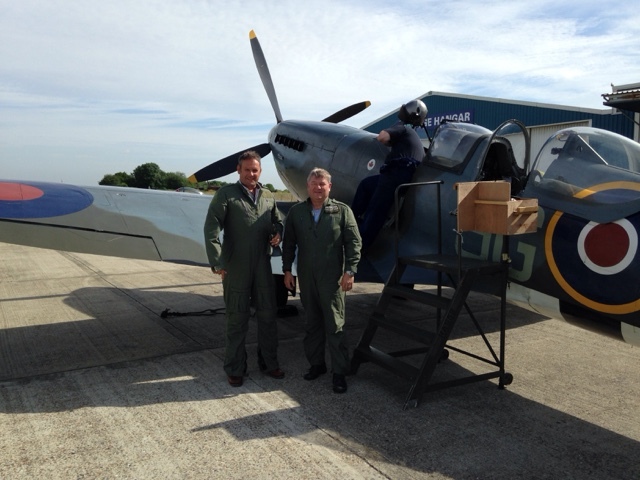 At the instruction of Don I now flew the Spitfire, banking left and right over Kent with London in the distance. For the next 15 minutes I was in seventh heaven. The initial emotional feelings of being in such an iconic aircraft now gave way to sheer fun. All to soon control was back with Don, however there was to be one final treat. The Spitfire was put into a shallow dive allowing the airspeed to increase. As we pulled out of the dive you could feel the G force pressing you back into the seat. 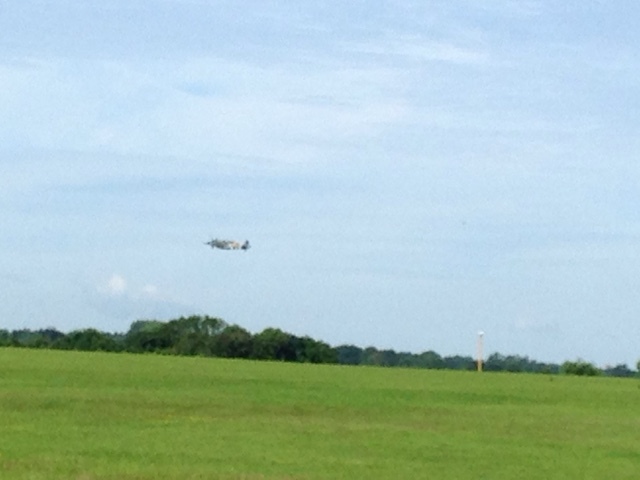 Then the aircraft rolled to the left, performing a victory roll. 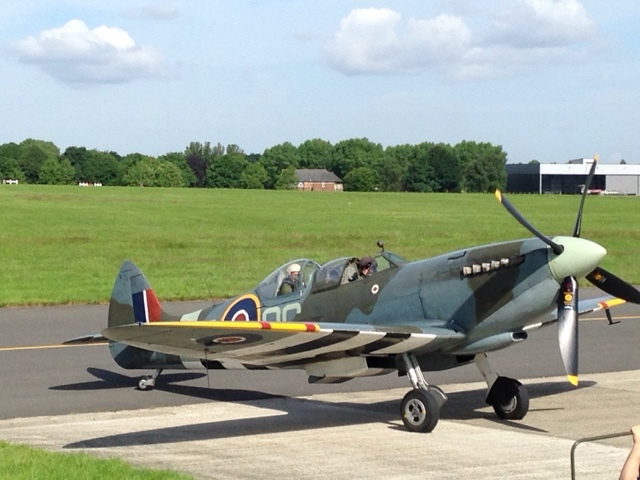 Well you simply can't fly in a Spitfire and not do that, can you. 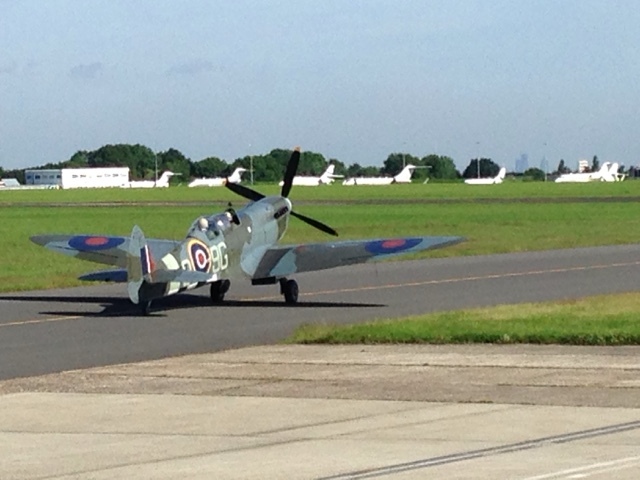 We then headed back to Biggin Hill for a perfect landing. Today we departed Yelvertoft Marina on our main summer cruise. We have no plan as such other than attending Glascote Basin towards the end of July for a Hudson boat owners gathering at the new Norton Canes base. We passed through Crick tunnel then took a mooring just north of the locks. Weekly update. 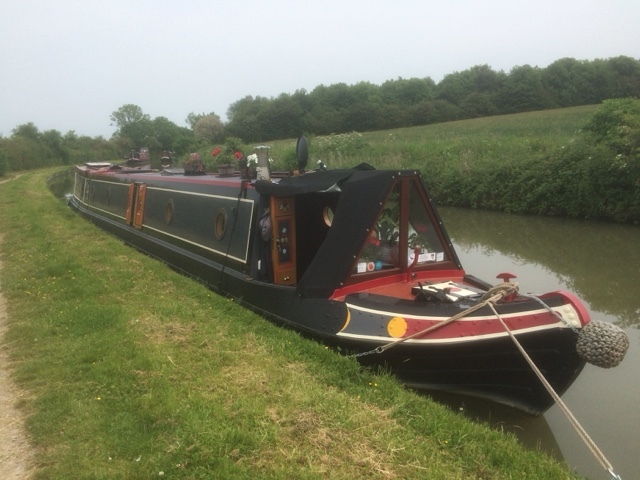 Following our short stay at Yelvertoft Marina to attend the Crick Boat Show, on Sunday 5/6 we departed in fine weather heading for Norton Junction. We waved to the crew of nb Adagio who were also due to be leaving, and turned left at the exit heading towards Crick. As we approached Crick Marina we saw most of the boats that had been moored on the, pay for towpath moorings, were now gone. Then it was on into Crick Tunnel for an unopposed transit. It was also unusually dry ish. We were soon at the top of the Watford Lock flight. There was a boat waiting, but soon after checking in with the lockeeper we were on our way down the staircase. Half way down, we again saw the crew of nb Adagio checking in. Later we found out they had a three hour wait, boy are we glad we got up slightly earlier than they did. Rounding the final bend towards Norton Junction and the Grand Union Canal it is always a lottery if the mooring spot will be empty or full. We were lucky. We had also arrived at lunchtime, so a quick call to the New Inn just round the corner secured a Sunday roast reservation. 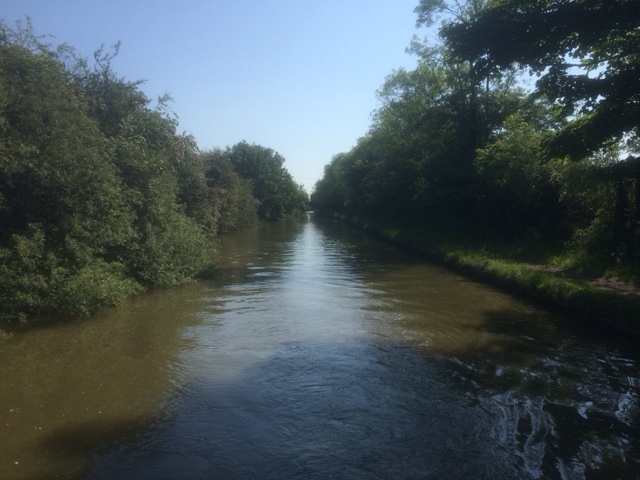 Monday 6/6, we were away early aiming for the area of Flecknoe on the South Oxford Canal. The weather was glorious as we turned right at the junction heading for Braunston. Viewing back towards Norton Junction. The previous day this stretch of canal had been really busy, we were expecting the same again. We were wrong. We had no boats with us in Braunston tunnel, and also none to share the six wide locks we now had to descend. The cottage by the top lock is for sale if you have a spare half a million, it's not one of the best we have seen, but does include 3 acres of land. Onwards down the flight we began to meet oncoming traffic, which meant the locks were in our favour as we arrived at them. Once through the bottom lock it was onto the junction where we turned left onto the Oxford Canal. About a mile and a half later we arrived at our intended spot taking a position just prior to bridge 100. The main mooring area beyond the bridge was very busy, but stopping where we did gave us the illusion of being on our own. Bridge 100 mooring spot on the Oxford Canal. Our plan was to stay here a few days until our appointment at Calcutt Boats on Thursday. 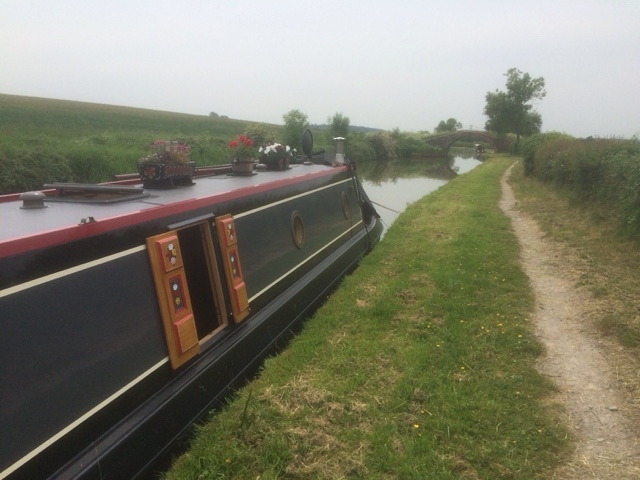 On Tuesday 7/6 we walked back into Braunston for lunch at the Boathouse, and on the way back we managed with a great deal of resolve, to avoid visiting the chandlers. Wednesday 8/6 we set to work with one of our Crick show purchases, 'Brass Mate'. For the past year the brass on our boat has had a lovely bronze look to it. Both our neighbours at Yelvertoft polish theirs, so now we too can join in the fun and games. We completed one side, and it is now so shiney you need sunglasses just to look at it. Thursday 9/6 we wanted to be at Calcutt for when they opened, so at a very early 7am we were underway. An hour later we turned right at Wigrams Turn, rejoining the Grand Union Canal, and then travelled the short distance to Calcutt locks. Descending one lock we then reversed onto the wharf and checked in at the office. Our hurricane diesel heater was still not functioning correctly in that the exhaust was at times giving off very strong fumes. The engineer dismantled the inner workings paying particular attention to the compressor, as the unit had been running at low pressure thereby causing an incomplete burn of the diesel. He soon found the problem, a small hairline crack in the unit that has probably been present since new. For this reason Calcutts did not charge me for a replacement despite being outside the warranty period, which I thought was decent. 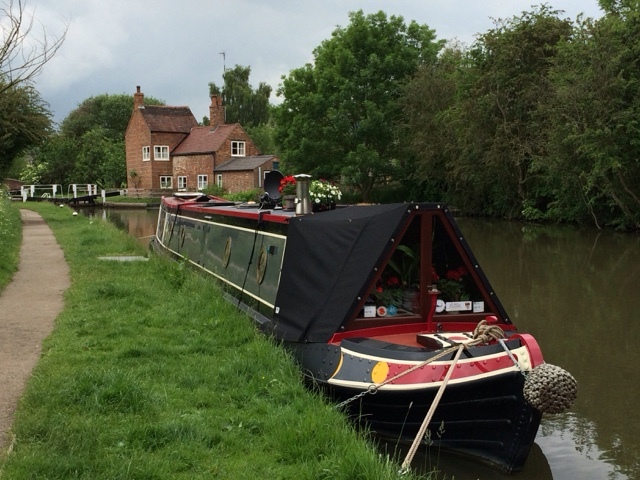 By noon we were on our way again heading for Napton on the Hill and a favourite mooring spot by bridge 116. We had six locks of the Napton flight to ascend but the flight is manned by lock volunteers, so sometimes you get some assistance, usually only at the bottom of the flight. Our chosen spot was free so we moored up planning to stay over the weekend. 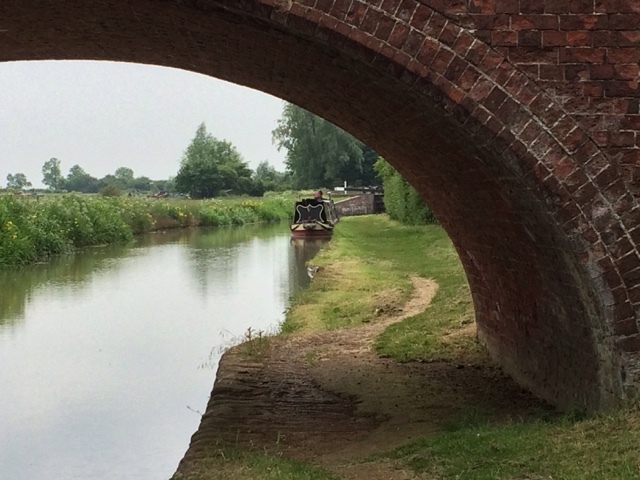 Mooring on the Napton flight by bridge 116. During Friday and Saturday we visited the pub and the village shop to support both. Today, Sunday 12/6 we had booked in for lunch at the Folly Inn. Mid morning we received a phone call from the pub cancelling the booking due to a power cut that had affected the whole village. To say we were devastated at the prospect of missing out on a roast dinner was an understatement. Luckily, 10 minutes later lunch was back on as the power had been restored. The pub however in that short time had lost quite a few bookings. The food as usual was excellent. Our plan is to head back slowly towards Norton Junction aiming to be there by next weekend.